Why do so many dishes cooked in high end restaurants taste so much better than those prepared at home? Steakhouse steak almost always tastes better for example. There are a few reasons for this actually, some you can do something about, some you can't. Firstly they use a LOT more salt than you do, way more actually. Secondly, they probably use better butter than you do, and more of it. Third, I often hear it said that restaurants get much better cuts of meat than a home cook can. While this is undoubtedly true if you get your meat at a run of the mill grocery store, you can pretty easily find excellent cuts of meat at a butcher shop (yes, they still exist, you just need to look). I find both Whole Foods and Costco have excellent meat, try to find "Dry Aged" meat rather than cuts straight from the Cry-o-Vac. The Fourth item on the list is heat, commercial stoves, broilers and grills can get exceedingly hot and easily produce a nice sear on the meat without over cooking, not much you can do about that. Lastly, they probably used a touch of Demi-Glace on it, or more if there is an actual sauce accompanying the steak. 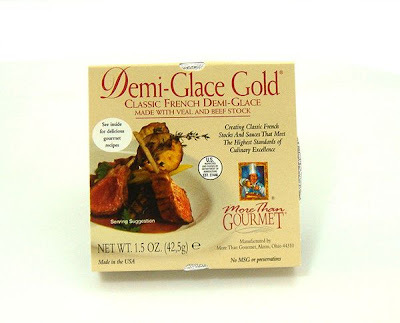 Demi-Glace is a French concoction that is basically Veal/Beef and Veggie stock which has been reduced down to a super concentrated, turbo stock. The trouble with Demi-Glace is that it takes forever and a day to make. The concentrate pictured above is a high quality, shelf stable Demi-Glace paste. You'll choke when you see the price given the quantity, but in reality it is much cheaper than going it on your own. Give it a go on your next steak, whip up a little Demi-Glace mushroom sauce, you won't regret it, like a good Catcher in baseball, Demi-Glace is a value multiplier. More Than Gourmet also makes a number of other sauces and stocks that are quite good, and their site has a number of good recipes incorporating their products.